Across the country, wage growth is slowly picking up as the economy strengthens. Both average hourly earnings, and the Employment Cost Index for wages and salaries are now approaching 3% annual growth. This is not great wage growth when we look historically. But, unfortunately, such gains are roughly in-line with inflation plus productivity growth in the economy, and also consistent with other measures of labor market slack like prime-age EPOP. As the labor market continues to improve, expectations are that wages will rise as well. That said, there are other issues impacting wage gains at the top line, including industry shifts over time and also those flowing into and out of the labor market distorting trends. The ECI, considered a better measure of wages, controls for the industrial shifts. But the flows of more-experienced, and higher-paid Boomers exiting the workforce, and being replaced by less-experienced, and lower-paid workers still weighs on aggregate wage gains. The Atlanta Fed’s Wage Tracker helps correct for this by examining wage growth for those who have been employed over the past year. Their numbers do indicate wages are increasing significantly faster and for a longer period of time, at about 3.5% annually for the past 3-4 years for the typical worker. Even so, the San Francisco Fed’s Wage Rigidity Meter shows the share of workers who received no raise in the past year still remains higher than in the past. All of the above sets the national stage, and we know Oregon’s wage growth has been considerably stronger then these gains. Average wages in Oregon have generally increased 3-4% annually in recent years. Due to these gains, Oregon’s average wage, while still lower than the nation’s, is at its highest relative point since the mills closed in the 1980s. However, these figures are also based on top line, or aggregate numbers which can mask some trends below the surface. Thankfully, Damon Runberg, a regional economist with the Oregon Employment Department, recently published some great research on Oregon wages that examines growth at the individual worker level. This is tremendous work and a great use of the wage file they have based on all workers covered by unemployment insurance. What Damon found, with a big wage file assist from Barbara Peniston, is that over the past three years, median hourly wages for the typical worker in Oregon increased a bit more than 3% per year. Remember, national wages are just now approaching 3%, so Oregon really has seen better gains. But what is a really striking finding, is Damon found that among Oregon workers who were continually employed over the entire 3 year period, their wage gains were more than 5% per year. Now, this pool of workers — those that recorded wages for each of the 12 consecutive quarters — is only about 1 in 4 private sector workers statewide. No question, it is a selective group. They’re not necessarily the lucky 25% or the best or most productive 25% of workers — we all know people who keep their job even though we don’t think they’re particularly good at it. But for those workers who are able to gain work experience, they are seeing significantly stronger wage growth than the top line data show. And Damon went back to a few different historical periods and found that today’s gains are stronger than during the housing boom, and stronger than those seen during the aftermath of the Great Recession. Another striking finding is that about 75% of Oregon workers are not continually employed over a multi-year stretch. Maybe a worker missed a quarter due to seasonal work, bad weather, illness, or the like. However migration into and out of Oregon, in addition to general labor market churn account for most of this figure. In fact, about 1 out of every 8 workers in Oregon are either gaining or losing a job every single quarter. That level of underlying churn is both higher than most people I talk with realize, and lower than it has been in the past. 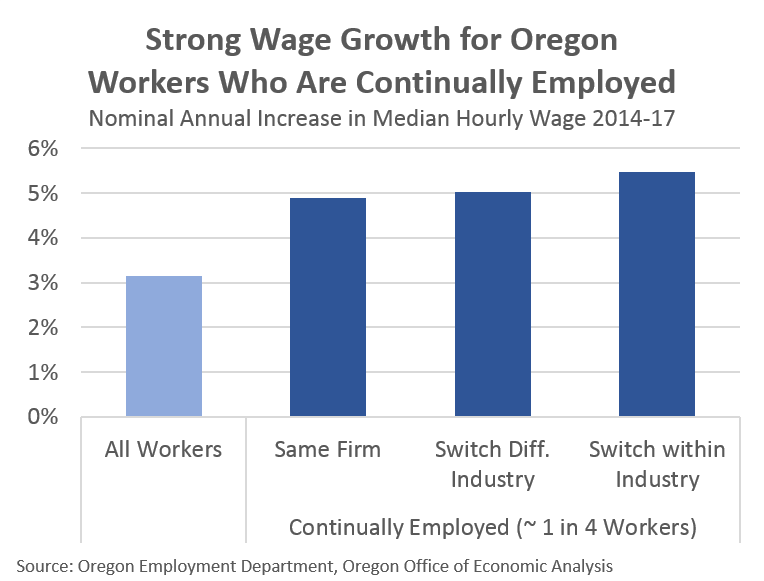 Furthermore, if all workers are seeing wage gains of about 3% and those that are continually employed are north of 5%, it means median hourly wages for Oregon workers who are not continually employed have increased about 2.5% annually in recent years. Not great, but certainly faster than nationwide trends given top line national numbers are in the 2.5% range. Do read the whole article as Damon walks you through the research and many different aspects and results, including the fact that the wage gains are strongest (in percentage terms) for the lowest paid workers, and there is a premium for workers who switch firms or industries as competitors have to bid up wages in order to hire away workers from other companies. This is why economists track the quits rate, as it measures worker confidence and also has implications for wage gains.